Just under two years ago I read and reviewed Darth Bane: Path of Destruction, which I thoroughly enjoyed. I remember at the time hoping that Drew Karpyshyn would write a sequel. I felt that Bane was an incredibly well realised character and one that the reader is drawn to and serves to illustrate that good and evil aren’t necessarily absolutes. A couple of weeks ago I was pleased to learn that a sequel had been released so I bought a copy and read it in the space of two evenings. Only two there should be; no more, no less. At the beginning of the book, after Brotherhood have all been destroyed by a thought bomb, Bane comes across a young ten year old girl who is sensitive to the Force, and who in a fit of rage kills two Jedi. Though she is young Rain possesses an instinctive link to the dark side that rivals his own. Bane is impressed by her power and takes her as his apprentice: Darth Zannah. With his guidance she will become essential in his quest to destroy the Jedi and dominate the galaxy. It’s a wonderfully entertaining book, that captivates from beginning to end. We learn more about Bane and his ambitions and his quest for greater knowledge and power. We watch as he continuously tests his young apprentice and we are not only drawn into his scheming but also into hers. 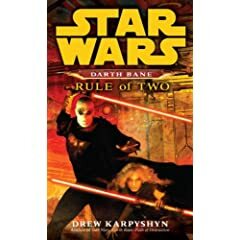 This serves to constantly remind the reader that the essence of the Rule of Two is that the Apprentice will one day grow stronger or more cunning than his/her own master and on that day must kill the Master, assume the mantle of Dark Lord of the Sith, and find an apprentice to train in the ways of the Dark Side. I wont reveal much more of the plot but I will recommend this book, as a great bit of fun reading … also I really hope there is a follow up since Bane’s story definitely does not end with this book. This entry was posted in Uncategorized and tagged book-review, Personal by Nadeem. Bookmark the permalink.